The good doctor had the right words. It’s a beautiful September evening in New Zealand. Clearing skies have revealed the milky way and the southern constellations. Almost dead center overhead, Saturn hangs, a slightly brighter dot against a sky full of bright dots, the likes of which we can no longer see at home in Los Angeles. Here, skies are dark enough that they can still be seen in something resembling their full natural beauty. Nothing about Saturn has changed in the past few minutes, at least not as viewed with my naked eyes. But if the calculations are correct (and we’ll only know for sure in about an hour and a half) a bus-sized emissary from this world to that one has just exploded into a kiloton-sized fireball in Saturn’s upper atmosphere. Cassini’s signals are still coming in, but they are ghosts: the final observations of an observer that no longer exists; a final letter from a now-gone family member. Cassini has orbited Saturn for most of the time that I’ve lived in Los Angeles. It was built in Pasadena while I was in grad school down the freeway at UCLA, launched during my foray to northern regions, and entered orbit shortly after I moved back. For most of that time, updates, images and discoveries have been regular features of my life as are the huge cast of characters in Pasadena at JPL, the Planetary Society, Caltech and a variety of other supporting groups. Over those years, the internet has increasingly brought Cassini and the people who created and operated it over the years into my life as an extended family of humanity and our robotic missionaries to the planets and stars. I’ve lived through a lifetime of discoveries and exploration, starting with men on the moon, up through New Horizons’ visit to Pluto last year. Cassini was arguably the greatest of these missions, sending back unprecedented amounts of data and imagery from one of the most mysterious planetary bodies. That data will be analyzed for years to come. The last of the photographs just arrived here a few hours ago, after Cassini’s cameras were shut down, the contents of its memory were transmitted and it was placed in a live transmission mode, sending limited atmospheric observations in real time. Now I find myself at the other end of the earth to witness, or at least to stand testament to the end, almost directly over my head, 1.5 billion km away. In Pasadena, Colorado, and many other places where the work has been done, Saturn is no longer visible. 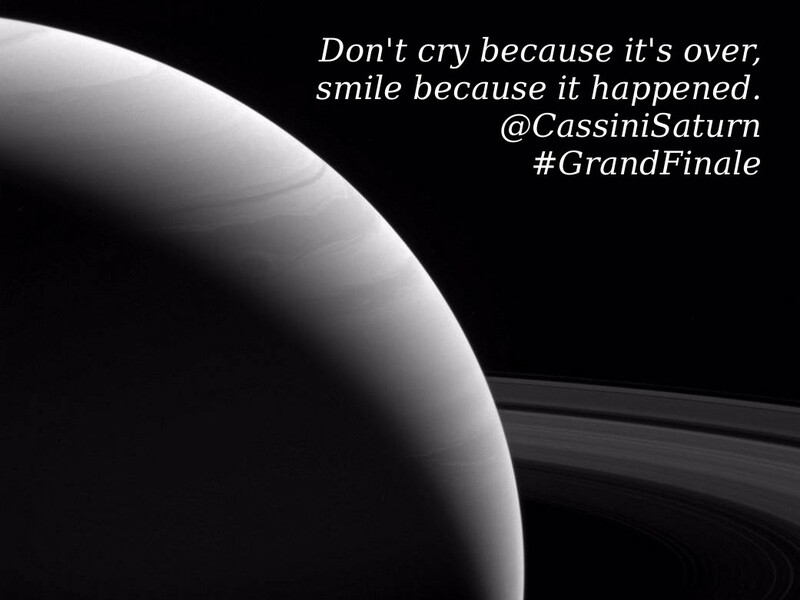 Here it hangs above, and for the first time in more than 13 years, Cassini no longer orbits. ← Christchurch, Canterbury Tech Summit, etc. Why do I have a BA in Computer Science?